Somebody put up a link of a Si Cranstoun video on FaceBook. 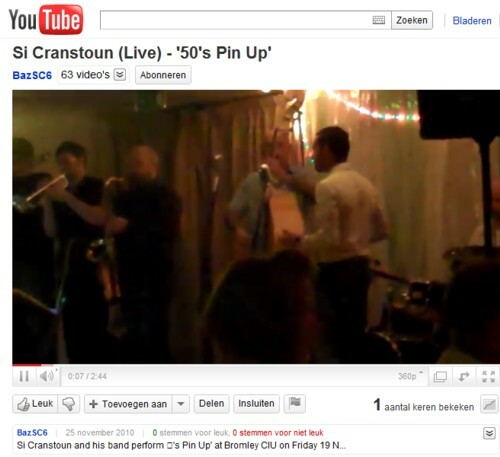 I liked all of it: the song, the band, Si Cranstouns voice, his moves and most of all his uplifting presence. I have tried to see al his video’s, ordered his cd’s (could only find one where he is in a ska band called The Dualers, but there must be more) and the more i heard and saw of this guy, the more i liked him. There are some noce video’s where he is singing on the street, on a fleamarket, often with his partner from The Dualers, and he sings there just as good as on stage. I guess you can find the rest of his video’s yourself. I warn you: it is a lot! Usually a singer or band has a limited repertoire, but this guy seems to have an endlesslist of songs in his head. I must have seen/heard over a forty different songs! And yes, his voice sounds almost exactly like that of the late Jackie Wilson. There are several references in his song lyrics to this fact, and he even can be seen in one video on stage with the son of Jackie Wilson. Boy, do i love music! Thanks for the info, Suzanne. I never buy music online, i hope that there will be a store in amsterdam that sells the cd’s of Si, both solo and The Dualers. Een toffe performer met een goede stem. Muziek is wel wat gewoontjes of ben ik nou weer een snob?